Tonight on The Walking Dead, we finally learn the chilling truth behind Michonne and Daryl’s scars. 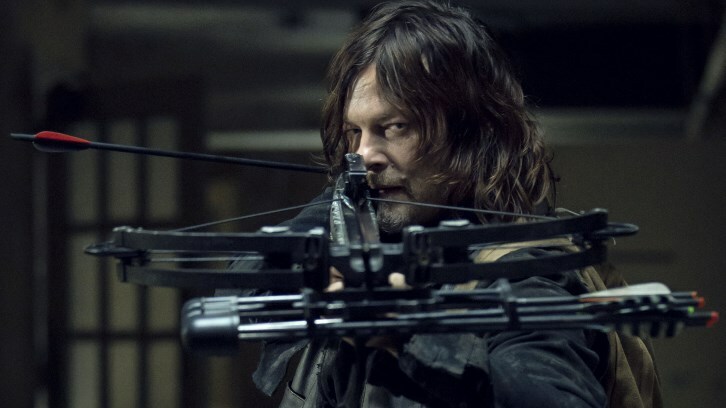 The plot: When Daryl leads Connie, Lydia, and Henry to Alexandria, Michonne is wary but lets them in, but makes no bones about not wanting them to stay, not trusting Lydia, and even suggesting Lydia leave on her own so that she removes the danger from the rest of them. Judith continues to be upset about her refusal to help the other communities, and ends up running away to go help them herself. The entire scenario sets off memories of the last time Judith was away from Alexandria. Just about nine months after Rick’s ‘death,’ a very pregnant Michonne is still searching for his body when, unexpectedly, an old friend of hers from before, Jocelyn, shows up at the gates, injured and in need of help. Jocelyn has been caring for a group of kids on her own–the other adults with them died–and Michonne is glad to take them all in and to see her childhood friend again. Unfortunately, one of Jocelyn’s “sleepovers” turns into a kidnapping when she takes Judith and a number of other kids, along with all the food and medicine they can carry. Michonne and Daryl take off to find them, and when they do, they’re outnumbered and end up bound and branded with X’s by the kids at Jocelyn’s command. They get free but now the kids are trying to kill them, but Michonne doesn’t want to hurt the kids, even after one slashes her stomach. But when Jocelyn also attacks her, Michonne kills Jocelyn in front of the kids. The kids decide to kill Judith and the Alexandria kids, and try again to stab her in the stomach, resulting in Michonne having no choice but to do the unthinkable and kill the kids to save her own children. As a result, Alexandria closed their gates and focused on keeping their own people safe. In the present, Michonne sees Judith’s bike and goes into a field, slaughtering walkers and screaming for her daughter, who comes to help her at the end. Michonne tells her what happened, finally, and is surprised to learn that Judith did remember, but didn’t talk about it because it made Michonne sad. But she understands that those people were bad and why Michonne did what she did, because she loves her kids. But Judith asks, when did we stop loving everyone else? Michonne finally agrees, and the two set off for Kingdom, picking up Daryl and company along the way. We’ve waited for many episodes now to find out what happened to Michonne and Daryl, what lead to Alexandria closing its gates and cutting themselves off. What could possibly be so bad and cause such a severe reaction from them? Well, TWD delivered a hell of a reason, alright, and I don’t know that I could say I’d have disagreed with the decision either, now. Everything about this messy situation sets up a perfect storm of terrible. Michonne is pregnant, mourning, feeling lost but also responsible for not just one child but one on the way and a whole community on top of that. She’s fixated on trying to find Rick’s body, to knowing his true final fate and getting closure, and feeling adrift without that. In that state, finding an unexpected familiar face from before was an absolute relief–here was someone else who had survived the end of the world and against all odds, in spite of everything that should’ve kept this reunion from happening, it happened! As Jocelyn herself puts it, what could be more impossible than that? It’s the kind of one in a million chance that no doubt gives Michonne a hint of hope that she can have not just closure about Rick, but that maybe, just maybe, he’ll come back to her, too. I can only imagine that this is the kind of moment that feels like a turning point for the better, the kind of good luck that could become an anchor, a sign of things changing for the better. To go from that to learning that this trusted friend has stolen not just their food and medicine but their children, including her adopted daughter, the last living reminder of Rick, has to be not just heart-breaking, but the kind of thing that will break a person all together. And then that’s not even the worst of it! Her former friend then goes on to capture her and Daryl and have her child army brand them and try to kill them, forcing Michonne to, ultimately, have to kill not only Jocelyn but almost all of those children, too! No wonder she shut down after this happened. Michonne tried so hard to not hurt them and it was heart-breaking to watch her have to make that choice. With everything that happened, it’s not at all surprising that she moved to shut Alexandria’s gates for good. The rest of the town trusts her when it comes to security matters, as we’ve seen, so it’s not surprising either that they followed her lead on this. After all, many of them almost lost their kids in this, too. In the present day, the reveal that Judith always remembered what happened is a good choice. She was around 3 by then, maybe close to 4, so it’s reasonable she would, and it feels right for her character. Judith has been shown to be very perceptive, particularly with those closest to her–Michonne and Negan, specifically–so that she noticed the change in Michonne while trying to respect it feels right. But times have changed, and as a kid her understanding only goes so far. She knows the world isn’t simple, but it is still simpler to her than it is to the adults. She hasn’t been through what they’ve been through, she doesn’t have the same worries that they do. But that doesn’t mean she’s wrong, and her question is yet another heart-breaking thing in the episode: if we protect the people we love, when did we stop caring about everyone else? There’s no good answer to that, of course. Michonne isn’t about to dismiss Judith’s question, she respects her too much to do that, and she knows it’s an entirely valid point. She’s not about to say no, we don’t love them, and deep down, she knows the right thing to do is to get back out there and help their friends. It’s what Carl and Rick would’ve done, but Michonne knows for herself that it’s the right choice here. The end scenes of mother and daughter at Carl’s grave, riding out to Kingdom, and then giving Daryl, Connie, Henry, and even Lydia a ride, are a great cap this episode. 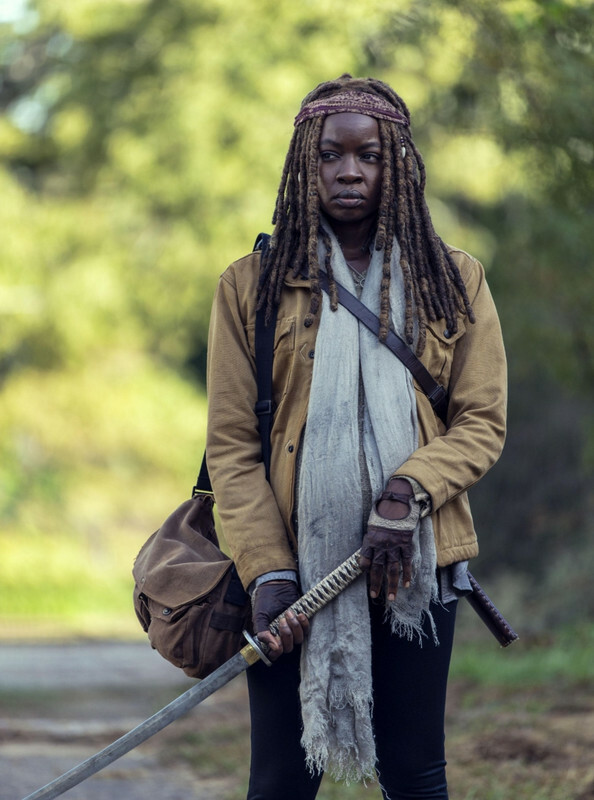 It feels like Michonne returning to who she was at long last, and I whole-heartedly celebrate that. Unfortunately, before we’re done, we get a sign of bad things to come when two Whisperers discover the Kingdom, complete with a loaded cart heading inside its gates, and plan to tell Alpha about it. This definitely doesn’t look good for our survivors. And as much as this episode was about Michonne’s past, it was also a very clear reminder about the dangers in their world: both the blind, fierce loyalty a group of brainwashed believers can have to a strong leader, and the limitless ferocity of a mother trying to save her child. Except now, both those things can be found with the bad guys. Look out, Kingdom, trouble is very much coming to your door. – I really liked the single scene that Michonne and Negan had. It was a great confrontation of two powerhouses in this show, but this time Michonne couldn’t ignore what Negan had to say. But also, Negan found a better way to say it by pointing out that yes, Judith very much is Michonne’s daughter, and she should realize just what that means. 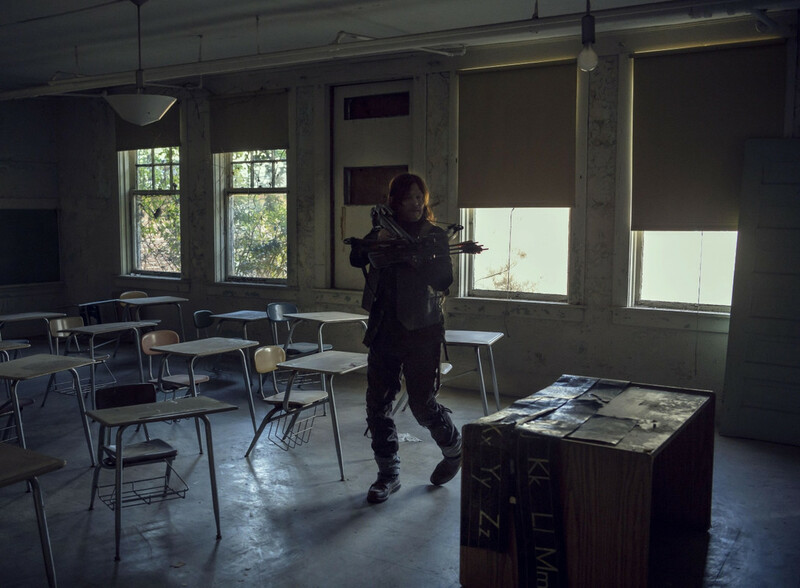 – I would’ve liked to see a little more of Daryl’s side of the journey; this was mostly about Michonne, and that was fine, it was still a great episode, I just wish we’d been able to get some more insight into how this affected him, too. – Michonne’s somewhat subtle attempt at manipulating Lydia into leaving and taking the danger away from everyone else with her was also a great scene. It was a smart new tact to try with her, and Lydia was definitely affected by it, though she clearly didn’t leave the others, as we later saw. – If you caught Talking Dead, Yvette Nicole Brown perfectly summed up my feelings on Henry and Lydia. This is clearly all thanks to Ezekiel’s influence! An excellent episode! The perfect storm of bad turns leading a vulnerable Michonne to have to do the unthinkable and kill a group of children in order to save her own isn't something I ever would've thought of as the reason for her shutting down Alexandria. But damn if it doesn't make perfect sense, precisely because of that. Everything about Michonne in the present day makes sense, even while it's still hard to see her being like this. But what brings her around to change again also makes perfect sense: love, inspired once again by her daughter. Danai Gurira was excellent throughout this episode, in both the flashbacks and present day, and navigated the complex shifts in Michonne perfectly. And Cailey Fleming as Judith continued to excel at playing her as both young but perceptive, smart but not unreasonably so. I've enjoyed her performance, and been impressed with the writing for her as well, this season and this episode helped hit the nail on the head in pointing out how she really is Michonne's daughter through and through. It's been a solid season so far, and this episode really took it that one step further with the flashbacks woven into the present day, wrapping not one but two believable major shifts into one hour.